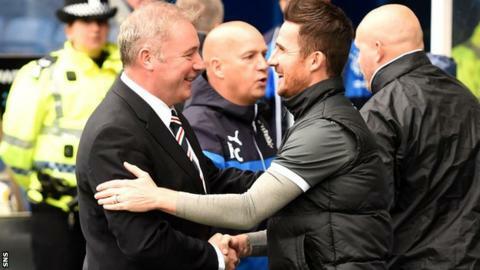 Former Rangers captain Barry Ferguson hopes Ally McCoist's status as a club legend is not soured by the nature of his expected departure as manager. Rangers are nine points behind Scottish Championship leaders Hearts after Friday's loss to Queen of the South. McCoist has handed in his notice but remains in charge as hard-up Rangers have yet to agree a pay-off. "The worrying thing for me is that the fans begin to turn against him - that's what I don't want," said Ferguson. "He was a legend in everybody's eyes - all-time record scorer, he was a fantastic player for Rangers. "I still think he will remain in the eyes of many Rangers fans a legend. I don't want that being tarnished." McCoist met Rangers board members on Wednesday but emerged still as manager despite predictions that a departure settlement would be agreed. "With the disappointing result they had on Friday night at Queen of the South, I was expected Coisty to not be there," Ferguson told BBC Scotland. "But nothing surprises me about what goes on at Rangers. "It was a difficult position Coisty was in and I was expecting Rangers to go out and steamroller Queen of the South. "But it was the opposite. That was a bit worrying for me." Ferguson, now manager at League Two club Clyde, finds it difficult to explain Rangers' recent poor performances under McCoist. "I have no doubt that in the dressing-room all the guys respect him," he said. "There is no doubting what Coisty has done at Rangers not just as a manager but as a player - he was one of my heroes when I was growing up." Ferguson points out that McCoist was still on target to achieve three promotions in a row since financial problems led to Rangers playing in the bottom tier. "At the end of the day, all Rangers have wanted to do the past three seasons is go up through the leagues and get back into the Premier," he said. "He's done it two years in a row. I know sometimes the football and performances have not been great, but do people bother with that a few years down the line? "Obviously they are nine points behind Hearts, but there is a long way to go and, if they don't go up as champions, I'm more than certain they'll go up via the play-offs." Where does McCoist decision leave Rangers? Read more on Ally McCoist: Where does manager decision leave Rangers?